Our new Mega Pod (aka hat box) has been specially designed for fine hats and collectables. Protect your valuable and keep them protected from dust and damage while keeping them organized and totally accessable. Pull one away, the rest will stay. 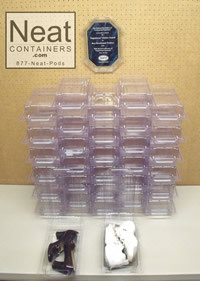 These new PODs work just like all the PODs in our classic 4.75" high series but the new Mega PODS weigh in with whopper size: 18.75"W x 19.125"D x 7"H.
Received my pods yesterday and imediately put them to good use organizing all of my shoes. 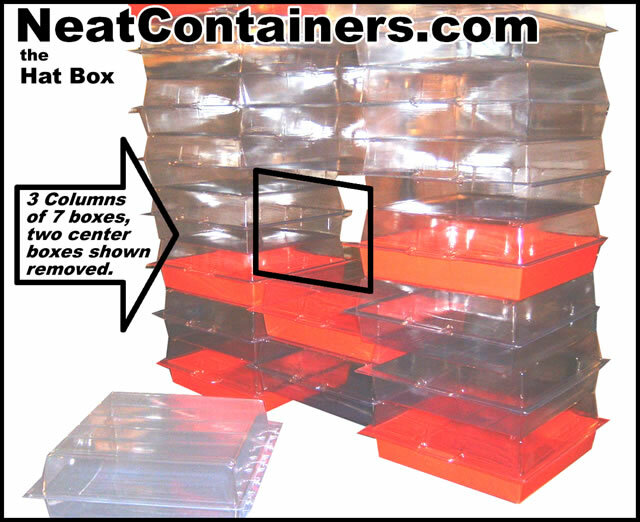 I owned some previous versions of this called "Magic Boxes" from QVC and they are almost exactly the same except lids are attached on my old version. They last years & years and I love the organization and ease of use it provides me in my closet space. So glad I found your website because they were discontinued from QVC. Please continue to make these great little organizers I would recommend to family and friends! Thanks..
Great idea! I can finally see my all of my shoes with space in my closet to spare. Made my day. Joan..
Great idea! I can finally see my all of my shoes with space ..